Its really annoying in Windows 8, everytime we go to a folder which contains hundreds of images or video files, image/video thumbnails are started appearing and we see the green bar is loading in the address bar. This is really annoying and in my case this lead to Windows explorer not responding situations and even restarting windows explorer. This is an issue in windows 8 which does not keep thumbnail cache for a long time. It automatically deletes thumbnail cache and thumbnails are rebuilt when a user browse to a folder containing files/sub folders. It is a simple way to prevent this automatic deletion. This is the place where windows keeps Windows Explorer cache including thumbnail cache. 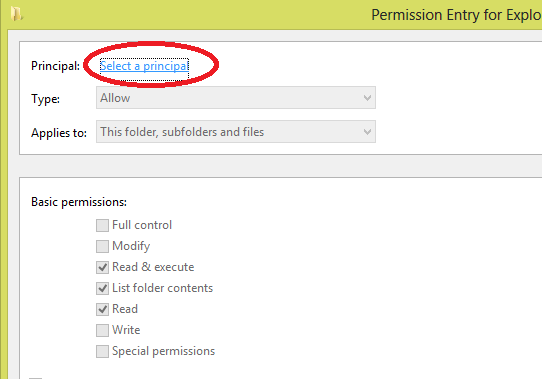 To prevent automatically deletion of the files in this directory, we have to create a security rule as follows. 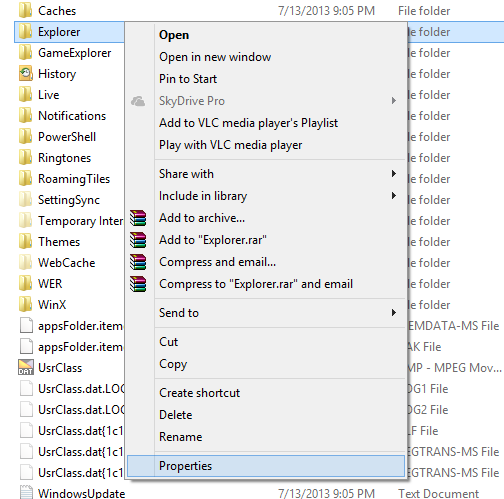 Right click the folder Explorer and go to properties. 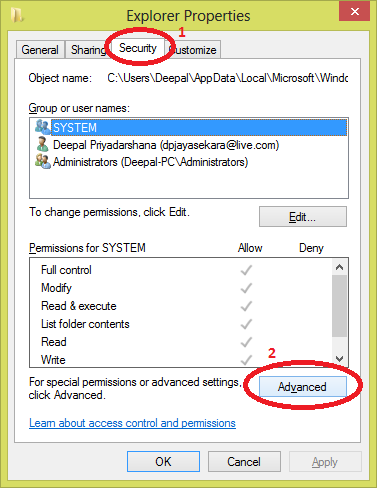 Then go to Security tab and click Advanced button below. In the dialog box next, click Add button to create a new rule. Then a small window should popup to select users that the rule should apply. Type your current username and click on Check Names. If you typed your username correct, a suggestion would appear accordingly and then hit OK.
Click on Show Advanced Permissions link and then check following shown items. 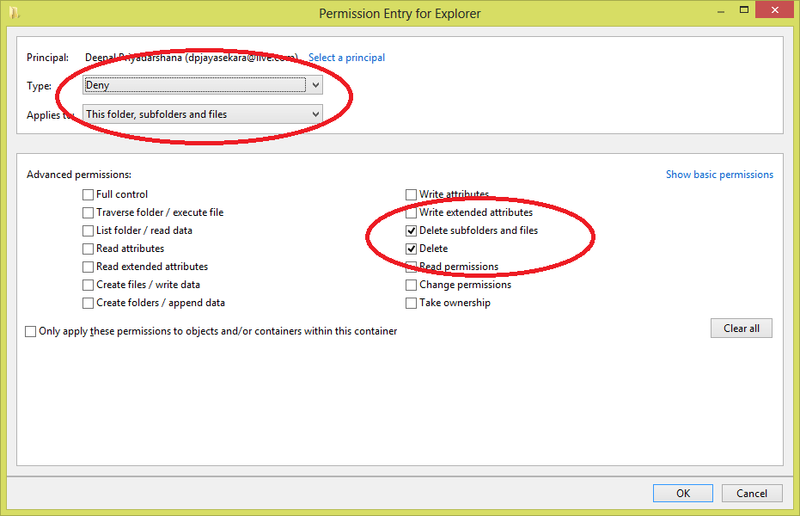 This procedure creates a rule which denies your username to delete content in the Explorer folder. 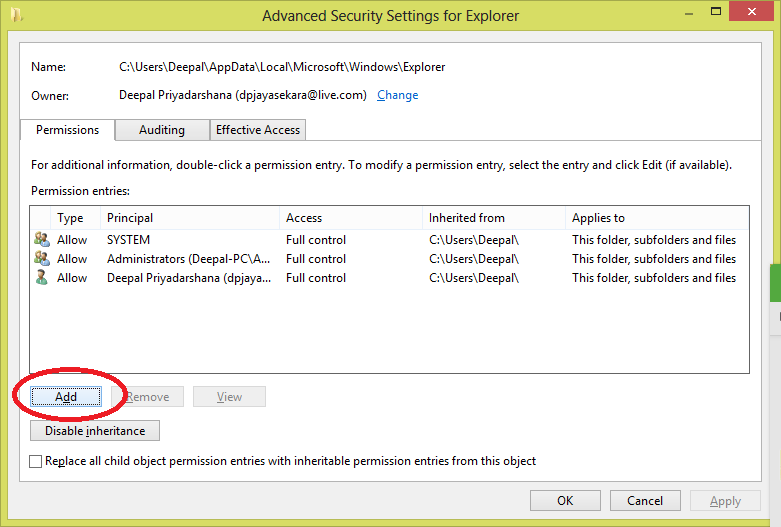 Then, when you are logged into your account in windows 8, windows cannot delete the thumbnail cache with your permissions. That would solve our problem. But there is a simple issue here. If you ever want to perform a disk clean up with cleaning up thumbnail cache, you won't be able to complete it since you are denied deleting thumbnail cache. So if you want to delete the thumbnail cache, first you have to remove this rule.